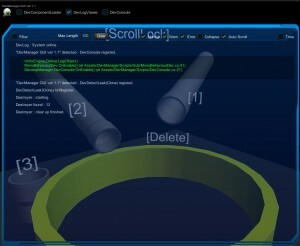 With this tool you can easily check your editor console logs inside the game. 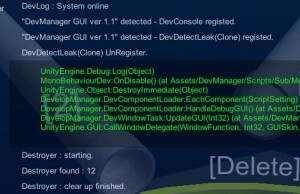 check your console log in game, on any platform. filter base on class / thread name. log time & detail trace. identity log type by color. basic in-game time scale control. You will need DevManager at scene already. Create a empty gameobject, and add “DevLogViewer.cs” on than object. Switch on “DevLogViewer” on Dock. then you will see the GUIWindow like this. 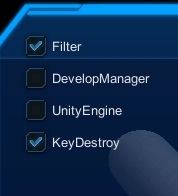 Filter – toggle on will display a list like this. it’s a filter function let user filtering the debug log base on dispatch function class. Max length – is the maximum number of log display on GUIWindow. Time – control time scale in-game. double click on those log you may found the log stace trace, in green color. 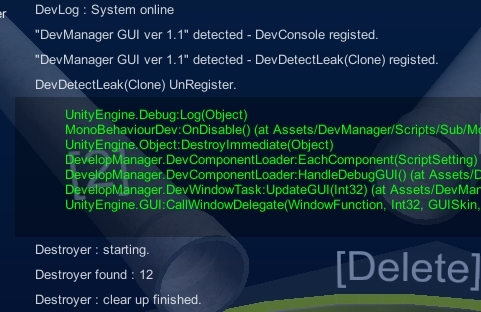 The end of DevLogViewer description.